Staying busy is the goal, especially in the freelance world of composing for film and television. Staying busy means you have a job, which means you’re making connections which means you’re building towards your ultimate goal. These days Sky Felix, a Recording Connection graduate, has been staying busy with composer Michael Corcoran. Sky has been working with Michael on projects that range from American Pie and New Year’s Eve to Best Friends Whenever and Shake It Up. Today, Sky has a blossoming career even though he was hardly certain about what he wanted to do just a few years ago. Although he was going through the right motions in his life, there was no burning desire, no definite goal on the horizon. Music had its place—that of being relegated to a hobby or pastime but it was hardly at the front of Sky’s mind as a viable career choice. Sky applied for the Recording Connection and was paired with Donny Baker of ES Audio in Los Angeles. His time at ES was perfect for him. Sky immersed himself in his apprenticeship and took as many opportunities as he could to expose himself to as much of the craft as possible. He jumped in with both feet, made connections, and honed his skills. This led to him working on an entire album with an indie artist he met at ES. 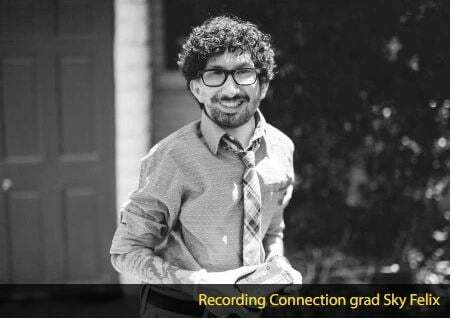 Then, a job lead came his way from a fellow Recording Connection student. Nevertheless, Sky took to the challenge and did well. The opportunities have kept on coming ever since. Despite his successes and the fact that he’s hardly looked back since starting Recording Connection, Sky Felix says he’s still paying his dues and learning on every single project that comes his way. Recording Connection grad Chris Litwin Opens Studio!